For insects as food items, see Insects as food. Entomophagy (/ˌɛntəˈmɒfədʒi/, from Greek ἔντομον éntomon, 'insect', and φᾰγεῖν phagein, 'to eat') describes the practice of eating insects by humans (as well as by non-human species). The eggs, larvae, pupae, and adults of certain insects have been eaten by humans from prehistoric times to the present day. Around 3,000 ethnic groups practice entomophagy. Human insect-eating is common to cultures in most parts of the world, including Central and South America, Africa, Asia, Australia, and New Zealand. Eighty percent of the world's nations eat insects of 1,000 to 2,000 species. In some societies entomophagy is uncommon or taboo. Today, insect eating is uncommon in North America and Europe, but insects remain a popular food elsewhere, and some companies are trying to introduce insects as food into Western diets. FAO has registered some 1,900 edible insect species and estimates that there were, in 2005, some two billion insect consumers worldwide. They suggest eating insects as a possible solution to environmental degradation caused by livestock production. Entomophagy is sometimes defined broadly also to cover the eating of arthropods other than insects, including arachnids and myriapods. Insects and arachnids eaten around the world include crickets, cicadas, grasshoppers, ants, various beetle grubs (such as mealworms, the larvae of the darkling beetle), various species of caterpillar (such as bamboo worms, mopani worms, silkworms and waxworms), scorpions and tarantulas. There are over 1,900 known species of arthropods which are edible for humans. Recent assessments of the potential of large-scale entomophagy have led some experts to suggest insects as a potential alternative protein source to conventional livestock, citing possible benefits including greater efficiency, lower resource use, increased food security, and environmental and economic sustainability. Insects, nematodes and fungi that obtain their nutrition from insects are sometimes termed entomophagous, especially in the context of biological control applications. These may also be more specifically classified into predators, parasites or parasitoids, while viruses, bacteria and fungi that grow on or inside insects may also be termed "entomopathogenic" (see also entomopathogenic fungi). Carving of Cave grasshopper on animal bone discovered in the Magdalenian grotto of Les Trois Frères indicates a possible link with food magic. Before humans had tools to hunt or farm, insects may have represented an important part of their diet. Evidence has been found analyzing coprolites from caves in the US and Mexico. Coprolites in caves in the Ozark Mountains were found to contain ants, beetle larvae, lice, ticks, and mites. Evidence suggests that evolutionary precursors of Homo sapiens were also entomophagous. Insectivory also features to various degrees amongst extant primates, such as marmosets and tamarins, and some researchers suggest that the earliest primates were nocturnal, arboreal insectivores. Similarly, most extant apes are insectivorous to some degree. Cave paintings in Altamira, north Spain, which have been dated from about 30,000 to 9,000 BC, depict the collection of edible insects and wild bee nests, suggesting a possibly entomophagous society. Cocoons of wild silkworm (Triuncina religiosae) were found in ruins in Shanxi Province of China, from 2,000 to 2,500 years BC. The cocoons were discovered with large holes in them, suggesting the pupae were eaten. Many ancient entomophagy practices have changed little over time compared with other agricultural practices, leading to the development of modern traditional entomophagy. Indonesian botok tawon, spiced bee larvae steamed in banana leaf package. Many cultures embrace the eating of insects. Edible insects have long been used by ethnic groups in Asia, Africa, Mexico and South America as cheap and sustainable sources of protein. Up to 2,086 species are eaten by 3,071 ethnic groups in 130 countries. The species include 235 butterflies and moths, 344 beetles, 313 ants, bees and wasps, 239 grasshoppers, crickets and cockroaches, 39 termites, and 20 dragonflies, as well as cicadas. Insects are known to be eaten in 80 percent of the world's nations. The leafcutter ant Atta laevigata is traditionally eaten in some regions of Colombia and northeast Brazil. In southern Africa, the widespread moth Gonimbrasia belina's large caterpillar, the mopani or mopane worm, is a source of food protein. In Australia, the witchetty grub is eaten by the indigenous population. The grubs of Hypoderma tarandi, a reindeer parasite, were part of the traditional diet of the Nunamiut people. Udonga montana is a pentatomid bug that has periodic population outbreaks and is eaten in northeastern India. Traditionally several ethnic groups in Indonesia are known to consume insects—especially grasshoppers, crickets, termites, the larvae of the sago palm weevil, and bee. 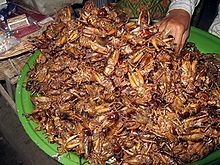 In Java and Kalimantan, grasshoppers and crickets are usually lightly battered and deep fried in palm oil as a crispy kripik or rempeyek snack. In Banyuwangi, East Java, there is a specialty botok called botok tawon (honeybee botok), which is beehives that contains bee larvae, being seasoned in spices and shredded coconut, wrapped inside a banana leaf package and steamed. Dayak tribes of Kalimantan, also Moluccans and Papuan tribes in Eastern Indonesia, are known to consumes ulat sagu (lit. 'sagoo caterpillar') or larvae of sago palm weevil. This protein-rich larvae is considered as a delicacy in Papua, eaten both roasted or uncooked. In Thailand, certain insects are also consumed, especially in northern provinces. Traditional markets in Thailand often have stalls selling deep-fried grasshoppers, cricket (ching rit), bee larvae, silkworm (non mai), ant eggs (khai mot) and termites. The use of insects as an ingredient in traditional foodstuffs in places such as Hidalgo in Mexico has been on a large enough scale to cause their populations to decline. Eating insects has not been adopted as a widespread practice in the West; however, there is a popular current trend towards the consumption of insects. By 2011, a few restaurants in the Western world regularly served insects. For example, two places in Vancouver, British Columbia, Canada, offer cricket-based items. Vij's Restaurant has parathas that are made from roasted crickets that are ground into a powder or meal. Its sister restaurant, Rangoli Restaurant, offers pizza that was made by sprinkling whole roasted crickets on naan dough. Aspire Food Group was the first large-scale industrialized intensive farming entomophagy company in North America, using automated machinery in a 25,000-square-foot warehouse dedicated to raising organically-grown house crickets for human consumption. At Safeco Field, the home stadium of the baseball team the Seattle Mariners, grasshoppers are a popular novelty snack, selling in high volumes since they were introduced to the stadium's concessions stands in 2017. Casu marzu is a traditional Sardinian sheep milk cheese that contains insect larvae. Within Western culture, entomophagy (barring some food additives, such as carmine and shellac) is seen as taboo. There are some exceptions. Casu marzu, for example, also called casu modde, casu cundhídu, or in Italian formaggio marcio, is a cheese made in Sardinia notable for being riddled with live insect larvae. Casu marzu means 'rotten cheese' in Sardinian language and is known colloquially as maggot cheese. A scene in the Italian film Mondo Cane (1962) features an insect banquet for shock effect, and a scene from Indiana Jones and the Temple of Doom features insects as part of a similar banquet for shock factor. Western avoidance of entomophagy coexists with the consumption of other invertebrates such as molluscs and the insects' close arthropod relatives crustaceans, and is not based on taste or food value. Some schools of Islamic jurisprudence consider scorpions haram, but eating locusts as halal. Others prohibit all animals that creep, including insects. 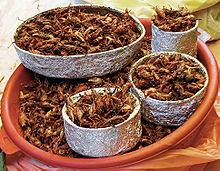 Within Judaism, most insects are not considered kosher, with the disputed exception of a few species of "kosher locust" which are accepted by certain communities. Public health nutritionist Alan Dangour has argued that large-scale entomophagy in Western culture faces "extremely large" barriers, which are "perhaps currently even likely to be insurmountable." There is widespread disgust at entomophagy in the West, the image of insects being "unclean and disease-carrying"; there have been certain notable individual exceptions, for example the celebrity Angelina Jolie has been widely pictured cooking and eating arthropod "bugs" including a spider and a scorpion, but there is little sign that this is anything other than a case of a single celebrity trying to experience a wider global perspective, nor that Jolie herself eats insects as a primary part of her diet, as opposed to experimentally or for the publicity value inherent in such an activity. The anthropologist Marvin Harris has suggested that the eating of insects is taboo in cultures that have other protein sources which require more work to obtain, such as poultry or cattle, though there are cultures which feature both animal husbandry and entomophagy. Examples can be found in Botswana, South Africa and Zimbabwe where strong cattle-raising traditions co-exist with entomophagy of insects like the mopane worm. In addition, people in cultures where entomophagy is common are not indiscriminate in their choice of insects, as Thai consumers of insects perceive edible insects not consumed within their culture in a similar way as Western consumers. The major role of entomophagy in human food security is well-documented. While more attention is needed to fully assess the potential of edible insects, they provide a natural source of essential carbohydrates, proteins, fats, minerals and vitamins and offer an opportunity to bridge the gap in protein consumption between poor and wealthy nations but also to lighten the ecological footprint. Many insects contain abundant stores of lysine, an amino acid deficient in the diets of many people who depend heavily on grain. Some argue that the combination of increasing land use pressure, climate change, and food grain shortages due to the use of corn as a biofuel feedstock will cause serious challenges for attempts to meet future protein demand. The first publication to suggest that edible insects could ease the problems of global food shortages was by Meyer-Rochow in 1975. Insects as food and feed have emerged as an especially relevant issue in the 21st century due to the rising cost of animal protein, food and feed insecurity, environmental pressures, population growth and increasing demand for protein among the middle classes. At the 2013 International Conference on Forests for Food Security and Nutrition, the Food and Agriculture Organization of the United Nations released a publication titled Edible insects - Future prospects for food and feed security describing the contribution of insects to food security. It shows the many traditional and potential new uses of insects for direct human consumption and the opportunities for and constraints to farming them for food and feed. It examines the body of research on issues such as insect nutrition and food safety, the use of insects as animal feed, and the processing and preservation of insects and their products. The intentional cultivation of insects and edible arthropods for human food, referred to as "minilivestock", is now emerging in animal husbandry as an ecologically sound concept. Several analyses have found insect farming to be a more environmentally friendly alternative to traditional animal livestocking. In Thailand, two types of edible insects (cricket and palm weevil larvae) are commonly farmed in the north and south respectively. Cricket-farming approaches throughout the northeast are similar and breeding techniques have not changed much since the technology was introduced 15 years ago. Small-scale cricket farming, involving a small number of breeding tanks, is rarely found today and most of the farms are medium- or large-scale enterprises. Community cooperatives of cricket farmers have been established to disseminate information on technical farming, marketing and business issues, particularly in northeastern and northern Thailand. Cricket farming has developed into a significant animal husbandry sector and is the main source of income for a number of farmers. In 2013, there are approximately 20,000 farms operating 217,529 rearing pens. Total production over the last six years (1996-2011) has averaged around 7,500 tonnes per year. In the Western world, agricultural technology companies such as Tiny Farms have been founded with the aim of modernizing insect rearing techniques, permitting the scale and efficiency gains required for insects to displace other animal proteins in the human food supply. The first domestic insect farm, LIVIN Farms Hive, has recently been successfully Kickstarted and will allow for the production of 200-500g of mealworms per week, a step toward a more distributed domestic production system. In 2012, Dr. Aaron T. Dossey announced that his company, All Things Bugs, had been named a Grand Challenges Explorations winner by the Bill & Melinda Gates Foundation. Grand Challenges Explorations provides funding to individuals with ideas for new approaches to public health and development. The research project is titled "Good Bugs: Sustainable Food for Malnutrition in Children". Director of pediatric nutrition at the University of Alabama at Birmingham Frank Franklin has argued that since low calories and low protein are the main causes of death for approximately five million children annually, insect protein formulated into a ready-to-use therapeutic food similar to Nutriset's Plumpy'Nut could have potential as a relatively inexpensive solution to malnutrition. In 2009, Dr. Vercruysse from Ghent University in Belgium has proposed that insect protein can be used to generate hydrolysates, exerting both ACE inhibitory and antioxidant activity, which might be incorporated as a multifunctional ingredient into functional foods. Additionally, edible insects can provide a good source of unsaturated fats, thereby helping to reduce coronary disease. Edible insects can provide economic, nutritional, and ecological advantages to the indigenous populations that raise them. For instance, the mopane worm of South Africa provides a "flagship taxon" for the conservation of mopane woodlands. Some researchers have argued that edible insects provide a unique opportunity for insect conservation by combining issues of food security and forest conservation through a solution which includes appropriate habitat management and recognition of local traditional knowledge and enterprises. However, senior FAO forestry officer Patrick Durst claims that "Among forest managers, there is very little knowledge or appreciation of the potential for managing and harvesting insects sustainably. On the other hand, traditional forest-dwellers and forest-dependent people often possess remarkable knowledge of the insects and their management." Similarly, Julieta Ramos-Elorduy has stated that rural populations, who primarily "search, gather, fix, commercialize and store this important natural resource", do not exterminate the species which are valuable to their lives and livelihoods. According to the FAO, many experts see income opportunities for rural people involved in cultivation. However, adapting food technology and safety standards to insect-based foods would enhance these prospects by providing a clear legal foundation for insect-based foods. Larvae of the sago palm weevil, (Rhynchophorus ferrugineus), a serious pest of date, coconut and oil palms, is a delicacy in Papua New Guinea and eastern Indonesia. Some researchers have proposed entomophagy as a solution to policy incoherence created by traditional agriculture, by which conditions are created which favor a few insect species, which then multiply and are termed "pests". In parts of Mexico, the grasshopper Sphenarium purpurascens is controlled by its capture and use as food. Such strategies allow decreased use of pesticide and create a source of income for farmers totaling nearly US$3000 per family. Environmental impact aside, some argue that pesticide use is inefficient economically due to its destruction of insects which may contain up to 75 percent animal protein in order to save crops containing no more than 14 percent protein. The methods of matter assimilation and nutrient transport used by insects make insect cultivation a more efficient method of converting plant material into biomass than rearing traditional livestock. More than 10 times more plant material is needed to produce one kilogram of meat than one kilogram of insect biomass. The spatial usage and water requirements are only a fraction of that required to produce the same mass of food with cattle farming. Production of 150g of grasshopper meat requires very little water, while cattle requires 3290 liters to produce the same amount of beef. This indicates that lower natural resource use and ecosystem strain could be expected from insects at all levels of the supply chain. Edible insects also display much faster growth and breeding cycles than traditional livestock. An analysis of the carbon intensity of five edible insect species conducted at the University of Wageningen, Netherlands found that "the average daily gain (ADG) of the five insect species studied was 4.0-19.6 percent, the minimum value of this range being close to the 3.2% reported for pigs, whereas the maximum value was 6 times higher. Compared to cattle (0.3%), insect ADG values were much higher." Additionally, all insect species studied produced much lower amounts of ammonia than conventional livestock, though further research is needed to determine the long-term impact. The authors conclude that insects could serve as a more environmentally friendly source of dietary protein. Insects generally have a higher food conversion efficiency than more traditional meats, measured as efficiency of conversion of ingested food, or ECI. While many insects can have an energy input to protein output ratio of around 4:1, raised livestock has a ratio closer to 54:1. This is partially due to the fact that feed first needs to be grown for most traditional livestock. Additionally, endothermic (warm-blooded) vertebrates need to use a significantly greater amount of energy just to stay warm whereas ectothermic (cold-blooded) plants or insects do not. An index which can be used as a measure is the Efficiency of conversion of ingested food to body substance: for example, only 10% of ingested food is converted to body substance by beef cattle, versus 19–31% by silkworms and 44% by German cockroaches. Studies concerning the house cricket (Acheta domesticus) provide further evidence for the efficiency of insects as a food source. When reared at 30 °C or more and fed a diet of equal quality to the diet used to rear conventional livestock, crickets showed a food conversion twice as efficient as pigs and broiler chicks, four times that of sheep, and six times higher than steers when losses in carcass trim and dressing percentage are counted. Insects reproduce at a faster rate than beef animals. A female cricket can lay from 1,200 to 1,500 eggs in three to four weeks, while for beef the ratio is four breeding animals for each market animal produced. This gives house crickets a true food conversion efficiency almost 20 times higher than beef. Insects such as crickets are a complete protein and contain a useful amount, comparable with protein from soybeans, though less than in casein (found in foods such as cheese). They have dietary fiber and include mostly unsaturated fat and contain some vitamins and essential minerals. According to the United Nations Food and Agriculture Organization (FAO), animal agriculture makes a "very substantial contribution" to climate change, air pollution, land, soil and water degradation, land use concerns, deforestation and the reduction of biodiversity. The high growth and intensity of animal agriculture has caused ecological damage worldwide; with meat production predicted to double from now to 2050, maintaining the status quo's environmental impact would demand a 50 percent reduction of impacts per unit of output. As the FAO states, animal livestock "emerges as one of the top two or three most significant contributors to the most serious environmental problems, at every scale from local to global." Some researchers argue that establishing sustainable production systems will depend upon a large-scale replacement of traditional livestock with edible insects; such a shift would require a major change in Western perceptions of edible insects, pressure to conserve remaining habitats, and an economic push for food systems that incorporate insects into the supply chain. In total, the emissions of the livestock sector account for 18 percent of total anthropogenic greenhouse gas emissions, a greater share than the transportation sector. Using the ratio between body growth realized and carbon production as an indicator of environmental impact, conventional agriculture practices entail substantial negative impacts as compared to entomophagy. The University of Wageningen analysis found that the CO2 production per kilogram of mass gain for the five insect species studied was 39-129% that of pigs and 12-54% that of cattle. This finding corroborates existing literature on the higher feed conversion efficiency of insects as compared to mammalian livestock. For four of the five species studied, GHG emission was "much lower than documented for pigs when expressed per kg of mass gain and only around 1% of the GHG emission for ruminants." Animal livestock is the largest anthropogenic user of land. 26 percent of the Earth's ice-free terrestrial surface is occupied by grazing, while feedcrop production amounts to 33 percent of total arable land. Livestock production accounts for 70 percent of all agricultural land and 30 percent of the planet's land surface. According to the Food and Agriculture Organization, livestock activity such as overgrazing, erosion, and soil compaction, has been the primary cause of the degradation of 20 percent of the world's pastures and rangeland. Animal livestock is responsible for 64 percent of man-made ammonia emissions, which contribute significantly to acid rain. By extension, animal waste contributes to environmental pollution through nitrification and acidification of soil. The livestock sector [...] is probably the largest sectoral source of water pollution, contributing to eutrophication, "dead" zones in coastal areas, degradation of coral reefs, human health problems, emergence of antibiotic resistance and many others. The major sources of pollution are from animal wastes, antibiotics and hormones, chemicals from tanneries, fertilizers and pesticides used for feedcrops, and sediments from eroded pastures. Global figures are not available but in the United States, with the world's fourth largest land area, livestock are responsible for an estimated 55 percent of erosion and sediment, 37 percent of pesticide use, 50 percent of antibiotic use, and a third of the loads of nitrogen and phosphorus into freshwater resources. Livestock also affect the replenishment of freshwater by compacting soil, reducing infiltration, degrading the banks of watercourses, drying up floodplains and lowering water tables. There is potential for insects to be used as a protein source in insect based pet food. Novel protein sources have possible benefits for pets with sensitive gastrointestinal tracts or food allergies, as the proteins are not recognized by the animal's body, and therefore are less likely to cause irritation. Insects have also been shown to have a high palatibility to both companion and livestock animals. They have a good amino acid profile, and also contain many essential nutrients for companion animals. Insects have also been shown to have a high digestibility in pets. There have been studies done evaluating the protein quality of commonly used insects and their nutrient values in comparison to traditional pet food protein. Spore forming bacteria can spoil both raw and cooked insect protein, threatening to cause food poisoning. While edible insects must be processed with care, simple methods are available to prevent spoilage. Boiling before refrigeration is recommended; drying, acidification, or use in fermented foods also seem promising. In general, many insects are herbivorous and less problematic than omnivores. Cooking is advisable in ideal circumstances since parasites of concern may be present. But pesticide use can make insects unsuitable for human consumption. Herbicides can accumulate in insects through bioaccumulation. For example, when locust outbreaks are treated by spraying, people can no longer eat them. This may pose a problem since edible plants have been consumed by the locusts themselves. In some cases, insects may be edible regardless of their toxicity. In the Carnia region of Italy, moths of the Zygaenidae family have been eaten by children despite their potential toxicity. The moths are known to produce hydrogen cyanide precursors in both larvae and adults. However, the crops of the adult moths contain cyanogenic chemicals in extremely low quantities along with high concentrations of sugar, making Zygaena a convenient supplementary source of sugar during the early summer. The moths are very common and easy to catch by hand, and the low cyanogenic content makes Zygaena a minimally risky seasonal delicacy. Cases of lead poisoning after consumption of chapulines were reported by the California Department of Health Services in November 2003. Adverse allergic reactions are also a possible hazard. The Food and Agriculture Organization has displayed an interest in developing entomophagy on multiple occasions. In 2008, the FAO organized a conference to "discuss the potential for developing insects in the Asia and Pacific region.". According to Durst, FAO efforts in entomophagy will focus on regions in which entomophagy has been historically accepted but has recently experienced a decline in popularity. In 2011, the European Commission issued a request for reports on the current use of insects as food, with the promise that reports from each European Union member state would serve to inform legislative proposals for the new process for insect foods. According to NPR, the European Union is investing more than 4 million dollars to research entomophagy as a human protein source. ^ "Entomophagy (Eating insects)". Center for Invasive Species Research, University of California (Research). Retrieved 27 January 2014. ^ a b Ramos-Elorduy, Julieta; Menzel, Peter (1998). Creepy crawly cuisine: the gourmet guide to edible insects. Inner Traditions / Bear & Company. p. 44. ISBN 978-0-89281-747-4. Retrieved 23 April 2014. ^ a b Carrington, Damian (1 August 2010). "Insects could be the key to meeting food needs of growing global population". The Guardian. ^ a b c Ramos-Elorduy, Julieta (2009). "Anthropo-Entomophagy: Cultures, Evolution And Sustainability". Entomological Research. 39 (5): 271–288. doi:10.1111/j.1748-5967.2009.00238.x. ^ Meyer-Rochow, Victor Benno (2009). "Food taboos: their origins and purposes". Journal of Ethnobiology and Ethnomedicine. 5:18: 18. doi:10.1186/1746-4269-5-18. PMC 2711054. PMID 19563636. ^ McElroy, A.; Townsend, P. K. (1989). Medical Anthropology in Ecological Perspective. Westview Press. ISBN 978-0-8133-0742-8. ^ Thompson, Addie (7 July 2013). "Want To Help Solve The Global Food Crisis? Eat More Crickets". Forbes. ^ "Insects for food and feed" (Press releases). FAO. Retrieved 2019-02-17. ^ "Insects Are Food". Insects Are Food. Archived from the original on 7 May 2012. Retrieved 26 September 2012. ^ a b c d e f Oonincx, Dennis G. A. B.; Van Itterbeeck, Joost; Heetkamp, Marcel J. W.; Van Den Brand, Henry; Van Loon, Joop J. A.; Van Huis, Arnold (2010). Hansen, Immo A, ed. "An Exploration on Greenhouse Gas and Ammonia Production by Insect Species Suitable for Animal or Human Consumption". PLoS ONE. 5 (12): e14445. Bibcode:2010PLoSO...514445O. doi:10.1371/journal.pone.0014445. PMC 3012052. PMID 21206900. ^ a b c d e f Premalatha, M.; Abbasi, Tasneem; Abbasi, Tabassum; Abbasi, S.A. (2011). "Energy-efficient food production to reduce global warming and ecodegradation: The use of edible insects". Renewable and Sustainable Energy Reviews. 15 (9): 4357–4360. doi:10.1016/j.rser.2011.07.115. ^ a b c Gahukar, R.T. (August 2011). "Entomophagy and human food security". International Journal of Tropical Insect Science. 31 (3): 129–144. doi:10.1017/S1742758411000257. ^ a b Yen, Alan (2009). "Edible Insects: Traditional Knowledge or Western Phobia?". Entomological Research. 39 (5): 289–298. doi:10.1111/j.1748-5967.2009.00239.x. ^ Poinar, G.O. (1986). "Entomophagous Nematodes". Fortschritte der Zoologie. 32: 95–121. ^ Domnas, Aristotle J.; Warner, Steven A. (1991). "Biochemical Activities of Entomophagous Fungi". Critical Reviews in Microbiology. 18 (1): 1–13. doi:10.3109/10408419109113507. PMID 1854431. ^ Bodenheimer, F. S. (27 November 2013). Insects as Human Food: A Chapter of the Ecology of Man. Springer. p. 16. ISBN 978-94-017-6159-8. Retrieved 18 December 2015. ^ a b c d e f g Capinera, John L. (2004). Encyclopedia of Entomology. Kluwer Academic Publishers. ISBN 978-0-7923-8670-4. ^ Tutin, C. E.; Fernandez, M.; Rogers, M. E.; Williamson, E. A.; McGrew, W. C.; Altmann, S. A.; Southgate, D. A. T.; Crowe, I.; Tutin, C. E. G.; Whiten, A.; Conklin, N. L.; Barrett, L. (1991). "Foraging profiles of sympatric lowland gorillas and chimpanzees in the Lopé Reserve, Gabon". Philosophical Transactions of the Royal Society of London. Series B, Biological Sciences. 334 (1270): 179–85, discussion 185–186. doi:10.1098/rstb.1991.0107. PMID 1685576. ^ McGrew, W.C. (1992). Chimpanzee Material Culture: Implications for Human Evolution. Cambridge University Press. pp. 153–154. ISBN 978-0-521-42371-7. ^ Goodall, Jane (1986). The Chimpanzees of Gombe: Patterns of Behavior. The Belknap Press of Harvard Univ. Press. p. 248. ISBN 978-0-674-11649-8. ^ Oudhia, P. "Traditional medicinal knowledge about green leafhopper, Nephotettix spp., in Chhattisgarh (India)." International Rice Research Notes 25.3 (2000). ^ Oudhia, P. "Traditional medicinal knowledge about pod borer Helicoverpa armigera in Chhattisgarh, India." International Chickpea and Pigeonpea Newsletter 8 (2001): 14-15. ^ Oudhia, P. "Traditional medicinal knowledge about common insects and mites in India." ECOLOGY ENVIRONMENT AND CONSERVATION 8 (2002): 339-340. ^ Oudhia, P. "Traditional medicinal knowledge about red ant Oecophylla smaragdina (Fab. )[Hymenoptera; Formicidae] in Chhattisgarh, India." Insect Environment 8.3 (2002): 114-115. ^ Oudhia P. (2002). Traditional medicinal knowledge about Fireflies, Photuris sp. (Coleoptera : Lampyridae)in Chhattisgarh (India).Insect Environment, Vol.8(1):25. ^ Oudhia P. (2000). Common housefly Musca nebulo Wiedemann (Diptera: Muscidae) as medicinal insect in Chhattisgarh. Insect Environment.6(1):36-37. ^ Ramos-Elorduy, Julieta; Menzel, Peter (1998). Creepy crawly cuisine: the gourmet guide to edible insects. Inner Traditions / Bear & Company. p. 150. ISBN 978-0-89281-747-4. Retrieved 2 April 2010. ^ Thakur, N.S.A. ; Firake, D.M. (2012). "Ochrophora montana (Distant): a precious dietary supplement during famine in northeastern Himalaya" (PDF). Current Science. 102 (6): 845–846. ^ "Mencicipi Gurihnya Keripik Olahan Jangkrik". Kompas (in Indonesian). 13 September 2016. ^ Ira Rachmawati (12 December 2014). "Menikmati Sepincuk Botok Tawon di Banyuwangi". Kompas (in Indonesian). ^ Fidel Ali (18 June 2017). "Apa Rasanya Makan Ulat Sagu Hidup-hidup di Raja Ampat?". Kompas (in Indonesian). ^ "In pictures: Eating insects in Thailand". BBC News. ^ "Shatter the Looking Glass Magazine". Shatterthelookingglass.com. ^ Ramos-Elorduy, Julieta (2006). "Threatened edible insects in Hidalgo, Mexico and some measures to preserve them". Journal of Ethnobiology and Ethnomedicine. 2: 51. doi:10.1186/1746-4269-2-51. PMC 1716161. PMID 17144918. ^ Alcocer, Jesus (18 July 2018). "Putting out feelers in the cricket market". Bangkok Post. Retrieved 18 July 2018. ^ a b "Eating bugs fine in many cultures" Archived 10 January 2016 at the Wayback Machine, Vancouver Sun, 28 June 2008. ^ "Cuisine to chirp about", The Globe and Mail, 18 November 2011. ^ Carson, Erin (12 October 2017). "You're going to be eating crickets, so just get over it". Cnet. Archived from the original on 10 October 2018. ^ "Laws of Islam Concerning Food". Yomatari's Laws of Religion. 10 May 2011. Retrieved 26 September 2012. ^ "The Fiqh of Halal and Haram Animals". Shariahprogram.ca. Retrieved 1 August 2014. ^ Abramowitz, Jack. "Knee-High to a Grasshopper: The obligation to examine locusts for signs of being kosher". OU.org. Retrieved March 20, 2013. ^ a b Parry, Wayne (22 February 2012). "Study: Eating bugs could reduce global warming". Christian Science Monitor. Retrieved 30 November 2012. ^ Wilson, Cherry (21 February 2017). "Should we eat bugs like Angelina Jolie?". BBC. Retrieved 21 February 2017. ^ Tan, Hui Shan Grace; Fischer, Arnout R.H.; Tinchan, Patcharaporn; Stieger, Markus; Steenbekkers, L. P. A.; van Trijp, Hans C. M. (2015). "Insects as food: Exploring cultural exposure and individual experience as determinants of acceptance". Food Quality and Preference. 42: 78–89. doi:10.1016/j.foodqual.2015.01.013. ^ Gordon, David George (1998). The Eat-A-Bug Cookbook. Berkeley, California: Ten Speed Press. p. xiv. ISBN 978-0-89815-977-6. ^ Meyer-Rochow, V. B. (1975). "Can insects help to ease the problem of world food shortage?". ANZAAS Journal: "Search". 6 (7): 261–262. ^ Paoletti, M.G. (2005). Ecological implications of minilivestock: potential of insects, rodents, frogs, and snails. Science Publishers. p. 648. ISBN 978-1-57808-339-8. Retrieved 7 May 2010. ^ "Jiminy Cricket! Bugs could be next food craze". New York Times. 3 August 2014. ^ a b "Company Gets Grant To Develop Food Based On Insects to Fight Malnutrition". Eurasia Review. 12 May 2012. Retrieved 30 November 2012. ^ a b Yen, Alan (2009). "Entomophagy And Insect Conservation: Some Thoughts For Digestion". Journal of Insect Conservation. 13 (6): 667–670. doi:10.1007/s10841-008-9208-8. ^ a b c "Beastly bugs or edible delicacies". FAO Newsroom. 19 February 2008. Retrieved 30 November 2012. ^ a b Walsh, Bryan (29 May 2008). "Eating Bugs". Time. Archived from the original on 26 September 2012. ^ Oonincx, Dennis G. A. B.; Van Itterbeeck, Joost; Heetkamp, Marcel J. W.; Van den Brand, Henry; Van Loon, Joop J. A.; Van Huis, Arnold (2010). "An Exploration on Greenhouse Gas and Ammonia Production by Insect Species Suitable for Animal or Human Consumption". PLOS One. 5 (12): e14445. Bibcode:2010PLoSO...514445O. doi:10.1371/journal.pone.0014445. PMC 3012052. PMID 21206900. ^ "U.S. could feed 800 million people with grain that livestock eat, Cornell ecologist advises animal scientists Future water and energy shortages predicted to change face of American agriculture". Cornell Science News. 7 August 1997. ^ Van Huis, Arnold (2015). "Edible insects contributing to food security?". Agriculture & Food Security. 4 (20). doi:10.1186/s40066-015-0041-5. ^ Schmidt, Anatol; Call, Lisa; Macheiner, Lukas; Mayer, Helmut K. (2018). "Determination of vitamin B12 in four edible insect species by immunoaffinity and ultra-high performance liquid chromatography". Food Chemistry. 281: 124–129. doi:10.1016/j.foodchem.2018.12.039. PMID 30658738. ^ a b c d e f g h Henning Steinfeld; Pierre Gerber; Tom Wassenaar; Vincent Castel; Mauricio Rosales; Cees de Haan (2006). "Livestock's Long Shadow: Environmental issues and options". Food and Agriculture Organization of the United Nations. Retrieved 25 October 2012. ^ Bowlin, Cynthia (March 2010). "Novel Proteins and Food Allergens" (PDF). ^ Makkar, Harinder P. S.; Tran, Gilles; Heuzé, Valérie; Ankers, Philippe (1 November 2014). "State-of-the-art on use of insects as animal feed". Animal Feed Science and Technology. 197 (Supplement C): 1–33. doi:10.1016/j.anifeedsci.2014.07.008. ^ Oonincx, Dennis G. A. B.; Broekhoven, Sarah van; Huis, Arnold van; Loon, Joop J. A. van (2015). "Feed Conversion, Survival and Development, and Composition of Four Insect Species on Diets Composed of Food By-Products". PLOS ONE. 10 (12): e0144601. Bibcode:2015PLoSO..1044601O. doi:10.1371/journal.pone.0144601. PMC 4689427. PMID 26699129. ^ Bosch, Guido; Zhang, Sheng; Oonincx, Dennis G. A. B.; Hendriks, Wouter H. (2014). "Protein quality of insects as potential ingredients for dog and cat foods". Journal of Nutritional Science. 3: e29. doi:10.1017/jns.2014.23. PMC 4473158. PMID 26101598. ^ Klunder, H.C.; Wolkers-Rooijackers, J.; Korpela, J.M. ; Nout, M.J.R. (2012). "Microbiological aspects of processing and storage of edible insects". Food Control. 26 (2): 628–631. doi:10.1016/j.foodcont.2012.02.013. ^ Zagrobelny, Mika; Dreon, Angelo Leandro; Gomiero, Tiziano; Marcazzan, Gian Luigi; Glaring, Mikkel Andreas; Møller, Birger Lindberg; Paoletti, Maurizio G (2009). "Toxic Moths: Source of a Truly Safe Delicacy". Journal of Ethnobiology. 29: 64–76. doi:10.2993/0278-0771-29.1.64. ^ "State Health Department issues health warning on lead-contaminated chaplines (grasshoppers)". California Department of Health Services. 13 November 2003. Archived from the original on 1 January 2006. Retrieved 16 December 2006. ^ Phillips, Joel; Burkholder, Wendell (1995). "Allergies Related to Food Insect Production and Consumption". Food Insect Allergies. 8 (2). ^ Byrne, Jane (16 November 2011). "FSA flags up potential of purified insect protein". Food Navigator. Retrieved 30 November 2012. ^ Schultz, Teri (4 November 2012). "Time For A 'Bug Mac'? The Dutch Aim To Make Insects More Palatable". National Public Radio. Retrieved 30 November 2012. Dossey, Aaron (2013). "Why Insects Should Be in Your Diet". The Scientist. 27: 22–23. Dossey, Morales-Ramos and Rojas (2016). Insects as Sustainable Food Ingredients: Production, Processing and Food Applications. Elsevier. ISBN 9780128028568. Shockley and Dossey (2014). Insects for Human Consumption. Mass Production of Beneficial Organisms. pp. 617–652. doi:10.1016/B978-0-12-391453-8.00018-2. ISBN 9780123914538. DeFoliart, Gene (1992). "Insects as Human Food". Crop Protection. 11 (5): 395–399. doi:10.1016/0261-2194(92)90020-6. Archived from the original on 23 April 2015. Ichinose, Katsuya (9 February 1989). "More insect eating". Nature. 337 (6207): 513–514. Bibcode:1989Natur.337..513I. doi:10.1038/337513b0. PMID 2915701. Kantha, Sachi Sri. (24 November 1988). "Insect eating in Japan". Nature. 336 (6197): 316–317. Bibcode:1988Natur.336R.316K. doi:10.1038/336316b0. Meyer-Rochow, V.B. (January 2017). "Therapeutic arthropods and other, largely terrestrial, folk-medicinally important invertebrates: a comparative survey and review". Journal of Ethnobiology and Ethnomedicine. 13 (9): 1–31. doi:10.1186/s13002-017-0136-0. PMC 5296966. Taylor, Ronald L. (1975). Butterflies in My Stomach, or, Insects in human nutrition. John Gregory Tweed (illus.). Santa Barbara, California: Woodbridge Press. ISBN 978-0-912800-08-0. Wikimedia Commons has media related to Entomophagy. "Bug Vivant LLC: Gastronomy on Six Legs: Edible insect recipes, information, nutrition, and much more". "Edible insects". New Scientist. 2595 (2595): 56. 2007. doi:10.1016/s0262-4079(07)60691-5. DeFoliart, Gene R. (29 September 2002). "The Human Use of Insects as a Food Resource: A Bibliographic Account in Progress". University of Wisconsin–Madison. Archived from the original on 24 February 2007. Stewart, Jeff. "Understanding the Role of Insects in Foods and Foodways". Creepy Crawly Cooking. Frazier, Ian (1997). "It's Hard to Eat Just One". Outside. Archived from the original on 4 April 2005. Unger, Lana (20 January 1999). "Insect Snacks from Around the World". University of Kentucky. Toms, Rob; Thagwana, Mashudu (2003). "Eat your bugs - harvesting edible stink-bugs". Science in Africa. Archived from the original on 16 April 2011. Menzel, Peter; D'Aluisio, Faith (1998). Man Eating Bugs: The Art and Science of Eating Insects. Ten Speed Press. ISBN 978-1-58008-022-4. Dicke, Marcel. "Why not eat insects? ", TEDxAmsterdam. Retrieved 12 March 2011. "Entomo Farms - Recipes by Entomo Chef Caryn: Delicious Recipes from Main Dishes to Deserts by your Entomo Chef and You".